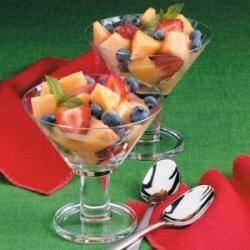 "'I like topping seasonal fruit with this smooth citrusy dressing,' shares Frances Poste of Wall, South Dakota. 'It makes a cool colorful treat for breakfast, lunch or a picnic.'" In a saucepan, combine the first seven ingredients. Bring to a boil; cook and stir for 2 minutes or until thickened and bubbly. Cool. Serve over fruit. Leftover dressing may be refrigerate for up to 1 week. Nutritional Analysis: 2 tablespoons dressing (calculated without fruit) equals 85 calories, trace fat (trace saturated fat), 0 cholesterol, 1 mg sodium, 22 g carbohydrate, trace fiber, 1 g protein. Diabetic Exchanges: 1-1/2 fruit. I used this recipe for a party and everyone loved it. I only used about 1 tbsp. of sugar, not 1/3 of a cup. It was delicious. I'll definitely use this recipe again. Very good. I made this dressing as is. I found it a little sweet. I will cut the sugar down next time to just a couple tablespoons. This made a beautiful glaze on my fruit salad. This was wonderful! I didn't have pineapple juice or orange juice concentrate. Just used 2/3 C. Fresh squeezed orange juice and the flavor was marvelous. Thanks!